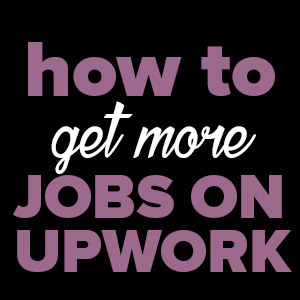 If you’ve been reading this blog for some time, you will know that we are huge fans of Upwork. We’ve written tons of articles about how to get started, get jobs and build a successful freelancing career on Upwork. You will hear a lot of negativity around Upwork and people who will tell you that it doesn’t work. Well, we disagree. It absolutely does. You can get high paying, good quality clients on Upwork (we have!). You just have to know how to approach it right. 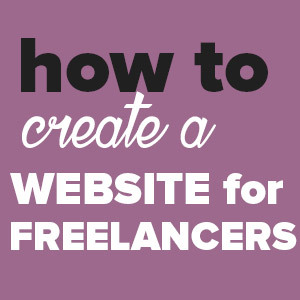 With the right strategy, you can definitely build up a well oiled freelancing machine that brings you clients without you even having to try too hard. 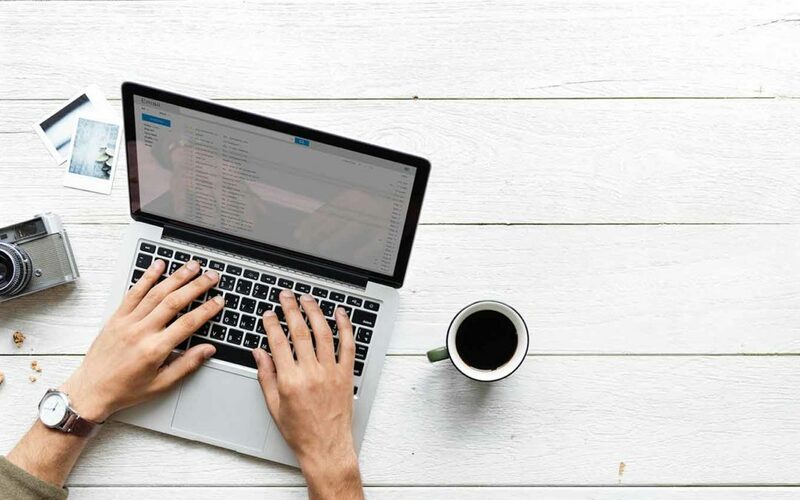 So if you’re a newbie freelancer and wondering what Upwork is and how to make it all work out for you – this is the post for you. If you’re a new freelancer, chances are you have no idea where to get your first client or even how to go about it. This is where Upwork comes in. So exactly what is Upwork? 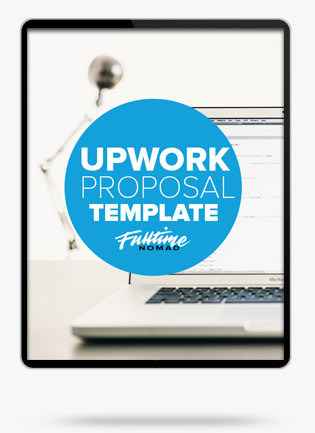 Upwork is a freelancing platform – one of the biggest around. Freelancers (like you) sign up and create a profile that highlights the skills you have to offer. Clients (business owners, startup people, entrepreneurs etc) post jobs on Upwork when they need help getting a job done. Getting a hang of how the site works can be a bit fuzzy at the beginning but it gets easier as you keep using it. As with most freelancing sites, the work of finding yourself some clients is all on you. Clients will normally posts jobs that they want done. You then bid on the jobs you want to work on by sending a proposal to the client. This, in a gist, is how it works. 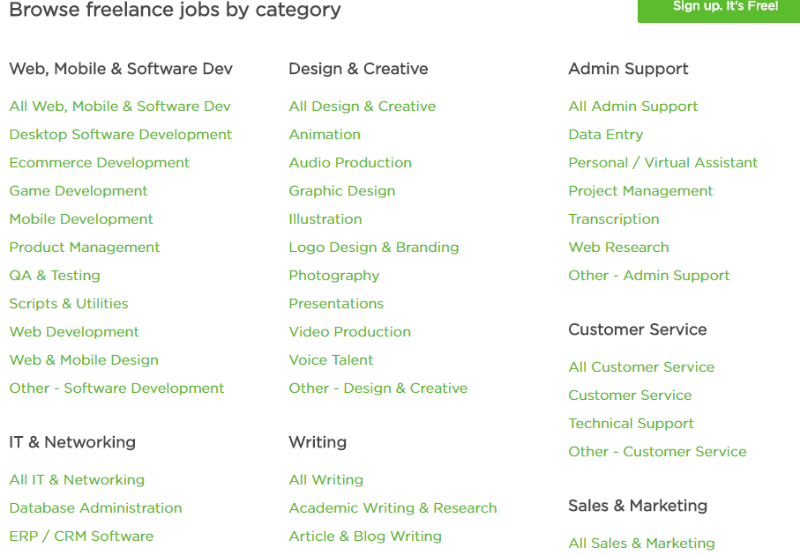 There are hundreds of jobs to choose from on Upwork.Upwork lists jobs in different categories including Web, Mobile & Software Dev, Design & Creative, Admin Support, IT & Networking, Writing, Customer Service, Sales & Marketing, Translation and many more. So is Upwork worth it for a freelancer? In short, yes. For the long version… keep reading. – You get to work on projects that excite and interest you. You pick the kind of projects that you want to work on. While as a beginner you may be tempted to take on any job that comes your way, with time you will realise that it’s much easier and better to work on projects that you enjoy. – Upwork clients are diverse and spread out worldwide. You can therefore seek work outside your geographical area expanding your chances of getting hired. Working with clients remotely gives you the perfect opportunity to travel the world as you work if travel is something you fancy. – There are so many clients looking to hire freelancers but most fear doing so because they don’t have the right infrastructure to manage freelancers. 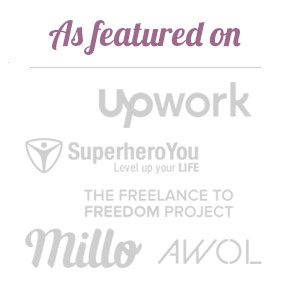 Freelancing sites like Upwork take care of this by doing all the work of managing freelancers. 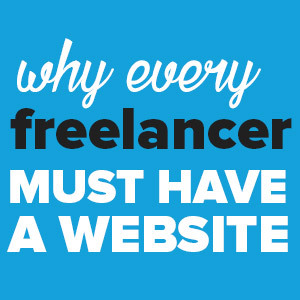 This gives more clients the confidence to hire and work with freelancers. In return, as a freelancer on Upwork you get a higher chance of finding reliable clients. – The ultimate goal for every successful freelancer is to have a constant stream of income from long term clients. Finding clients on your own when you’re starting out can be a struggle. But if you start out on Upwork and impress your clients you can easily get long term contracts as well as referrals. – Getting paid on Upwork is straightforward and secure. One of the reasons why most freelancers avoid using freelance platforms is the fear of losing their money after working hard. However, Upwork tracks any hours you work and bill the client automatically. For jobs that are charged per project and not hourly, the client is required to deposit funds into escrow. This assures you of payment once you deliver the project. How much does it cost to use Upwork? Joining Upwork is free for freelancers but you can also choose to upgrade to a Plus plan for $10 per month. While joining Upwork is free, working on the site is not. Upwork charges every freelancer a service fee. This is a percentage of your earnings charged when a client pays you. The service fee is a sliding fee based on your lifetime billings with each client. 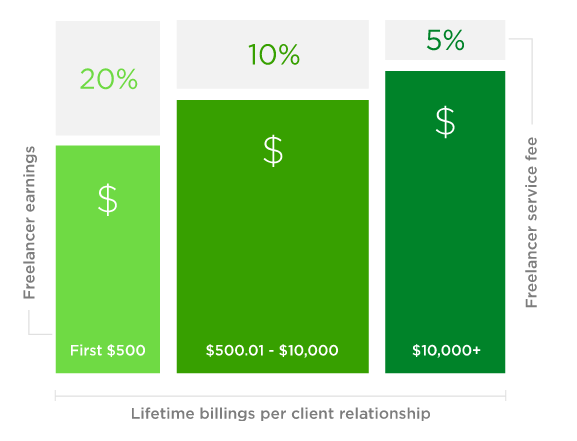 This means that the service fee reduces as you keep earning more from each client. 20% for every job as long as the amount paid by the client is below $500. Sounds a little bit complicated right? What this means is that for instance when you get the first job from a particular client and the amount paid is between $1-$500, Upwork will take away 20% of the amount paid. But if you get a second job and the total amount paid from the first job and the second job amounts to more than $500 but is less than $10,000 you the platform will take 10% from the amount paid for the second job. The idea behind the sliding fees is to encourage freelancers to perform their best in order to get recurring jobs from the same clients. This helps to improve the quality of work offered on the site and improving clients’ trust on the site. 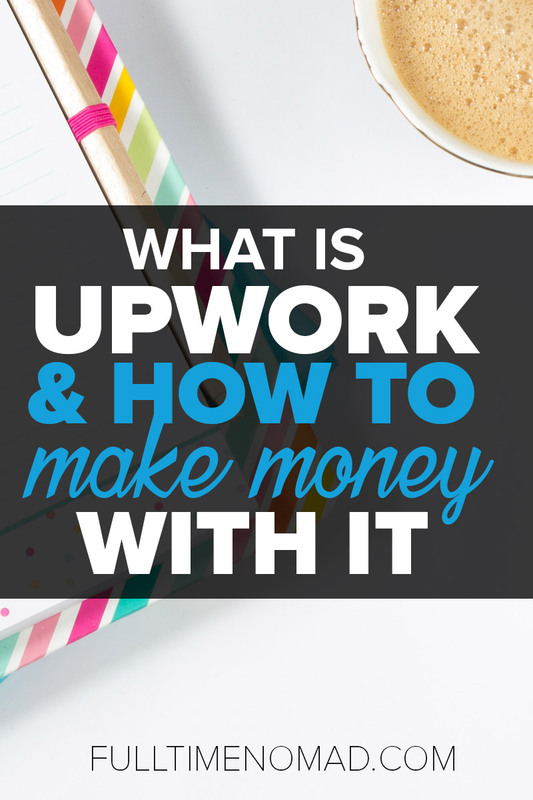 How do you get paid on Upwork? There are two types of contracts on Upwork – hourly and fixed price. Hourly projects are tracked on a weekly basis from Monday to Sunday. It’s your responsibility to ensure that every time you work on the hourly project the time worked is recorded on your work diary. Once the work week is over, the client has 5 days to dispute any time recorded. If there are no disputes the money will then be moved to your Upwork account. The funds will be ready for withdrawal after a few days. You can choose to withdraw your money from Upwork via different payment gateways including bank transfer, wire transfer, Paypal. The methods of withdrawal will depend on your country. More details here. Is Upwork Safe & Legit? Every freelancer’s biggest worry is not getting paid. Despite having contracts in place, we have all heard of freelancers who have been ripped off by their clients. And, when your clients are overseas sometimes there’s so little you can actually do! Argh!! Upwork helps to take care of this with its Payment Protection guarantee. What does this mean? For every hourly job you do, time will be tracked on a weekly basis and the client is billed automatically. Make sure that you use the Upwork Work Diary every week to track your work. If you have fixed-price jobs, clients are supposed to pre-fund each project before you start working. This way, there’s money at the end of the project. Always remind the client to fund a project before you start working on it. Your success on Upwork relies on creating a compelling profile that will make clients see you as a highly skilled professional. When creating your profile make sure that you focus on showing the client why hiring you is the best decision they will ever make. Complete your profile all the way to the end. Add a professional looking photo, create a catchy title and write a powerful description that shows the value to will bring to your client. Add a portfolio showcasing your past work. Mention your educational background and list your previous experience. Do not forget to take various tests in your skills set. All this information will act as proof of your expertise and convince clients that you’re the best candidate for the job. Think of your Upwork profile as a resume or marketing brochure. So highlight your professional skills, experience, portfolio, education and accomplishments. Don’t forget grammar. Make sure your profile is grammatically correct and error free regardless of the area of expertise you’re interested in. good grammar is not expected from writers and bloggers but from anyone who considers themselves a professional. We have an exhaustive article on How to Create an Upwork Profile That Gets You Clients, FAST. Make sure you check it out. How do you find clients on Upwork? Finding your first job on Upwork will be the hardest part when you’re getting started. Not going to pretend it’s a cake walk. Clients will typically hesitate to hire a newbie without past work or reviews on Upwork. But, don’t get discouraged because everyone has to start somewhere. To find clients on Upwork, type a keyword in the search box. There will be lots of jobs available so take a good look at each job and read the requirements carefully. Remember that you will be competing with other highly skilled freelancers both newbies and veterans. So you have to put your best foot forward. Focus your efforts on the jobs you’re highly qualified for. Avoid using a template. 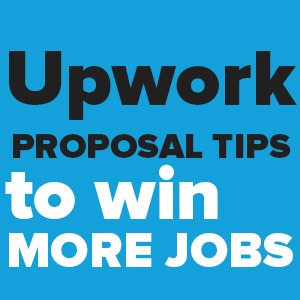 Optimise your proposal for every job that you apply for. This will show the client that you actually read the job description. Remember that a proposal introduces you to the client before they even read your profile. So make it a powerful teaser that will get the client curious to read the rest of your profile. Keep it short and informative. Avoid being ambiguous and instead go straight to telling the client how your skills will help to make the project a success. Here are 12 more tips on how to get your first job on Upwork. 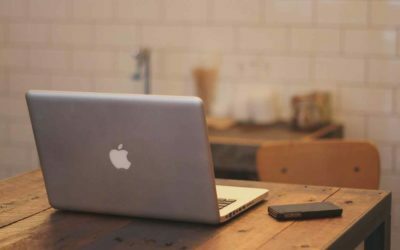 How do you become successful on Upwork? To help you get started and stay successful on Upwork, we’ve compiled some of our most popular Upwork-related articles from the blog. Go on, have a read and start implementing our tried and tested tips! 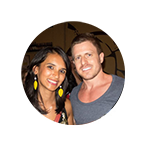 A kickass profile will set you on the road to success on Upwork. Get the work done, your freelancing future depends on how good your profile is. In this blog post, we break down every single section of your profile and show you what to include and what not to. new freelancers make on Upwork and make sure you don’t repeat them. What skills do you need to be a successful freelancer? Are there some skills that are in more demand than others? This blog post answers all of your skill-related questions. Ok so you’re sold on why Upwork is the platform to be in. You’ve signed up to the platform but you’ve been rejected. What next? We give you some tips here to help your profile get approved. Now that your Upwork profile is up and ready to go, it’s time to start applying for jobs. In this blog post, we share tips on how to write powerful proposals that make clients pay attention to you. Getting that first job is usually the hardest part. So don’t give up if you keep get rejected. To end the rejection streak, we bring you all our “first Upwork job” advice together into a nutshell. Have you heard about the Upwork Job Success Score (JSS)? Did you know that if your score falls below 70%, you risk having your account suspended? This blog post is all about helping you understand the JSS and how to make sure yours is always high. This post will help you stand out, attract clients and make it easier for you to get jobs (and make money). The most successful freelancers on Upwork are those who have established themselves as an expert in a certain niche. In this post we talk about why choosing a niche is important and how it can help you make more money on Upwork. Upwork is a great place to get your freelance business started. But with more people starting to freelance, it’s definitely becoming a competitive platform. To remain relevant and to make the best out of Upwork, it’s important you understand fully how it works. Take your time to create a profile sells and put in some thought when sending out proposals. Any more questions about Upwork? Let us know in the comments.